My skills with a wood burning pen are lacking, but my frequent mistakes resulted in me figuring out ways to fix mistakes. 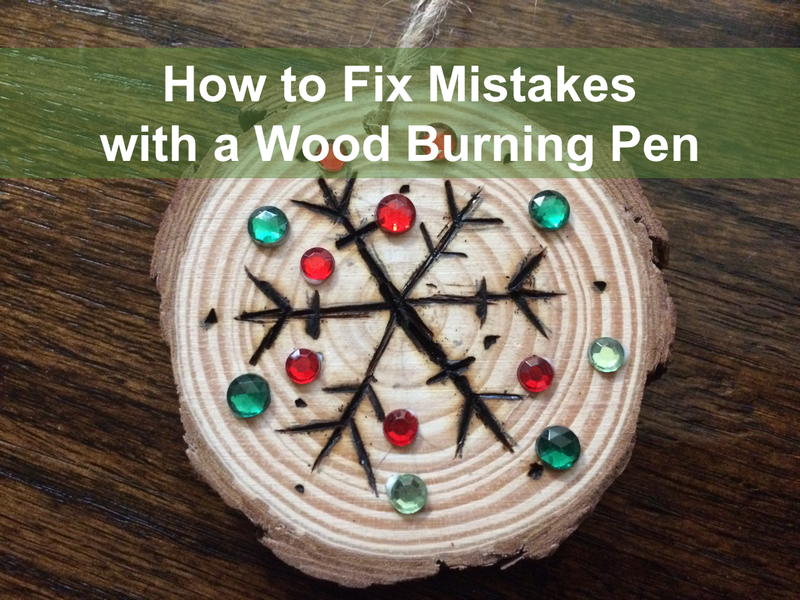 Here are ideas for how to correct mistakes from a wood burning pen craft. 1. Practice first. If this is your first time, practice on scrap wood You'll find that straight lines aren't too bad if you go slowly, but curves are very tricky. My first project was a cutting board with cursive initials. This was a terrible idea given my lack of skills. I should have made something with short and straight lines. 2. Draw patterns in pencil first. Pencil is easy to erase, so that's helpful! Trust me, planning ahead with pencil saves a lot of mistakes. 3. If you accidentally go off your design, you may possibly be able to thicken your lines to cover a mistake. Check out the pencil drawing above and then my work with the wood burning pen below. I messed up. I could not get the pen to create a straight line. I was able to fix my wood burning pen mistake by making the line thicker. It's not perfect, but is definitely more presentable in this case. 4. Sand your mistakes. If possible, use some sand paper to sand the area where you accidentally burned the wood in a bad way. In the photos here, I didn't want to use sand paper since I was able to thicken the lines and use the next trick. 5. Add embellishments. I added sparkly gems to hide the mistakes that I made with the wood burning pen. I simply glued those sparkly gems on and that essentially erased the wood burning mistakes. 6. Paint over your mistakes. In some cases, if it looks good, paint over a mistake. Similar to the embellishments above, get creative to detract from a wood burning pen mistake. In summary, I am definitely a pro at making mistakes with wood burning crafts and have experience with fixing mistakes that I made with a wood burning pen. I hope that my tips are helpful!